The Courtyard Gate: A Wise Woman??? 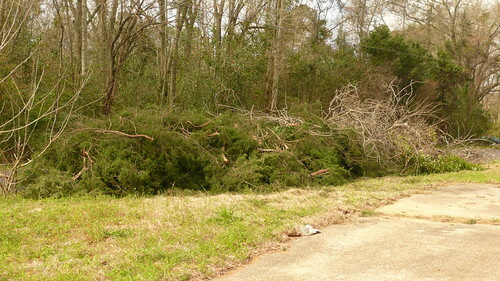 We had a couple of cedar trees cut down at a rental house because they were too close to the house. It's aggravating when folks don't consider the size something will be when it's mature. I really hated having to do it but they were ruining the roof. When one of them fell, 2 baby squirrels went flying. I didn't see it. I was upset enough when they told me. I walked over to where the guys were. One of them was looking for the babies. 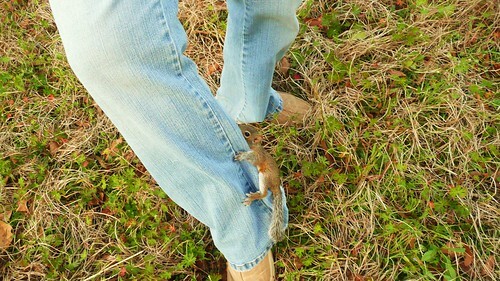 Then...one ran over to me...and attached to my jeans. Isn't it cute? So I reached down and picked the little fellow up. 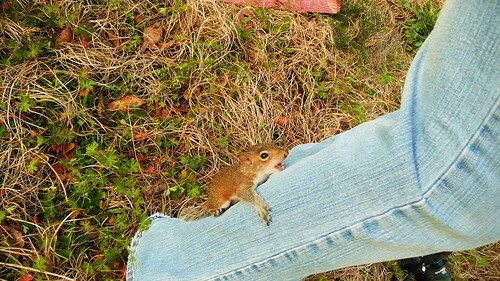 I didn't know if he would bite me or not but he was climbing up my jeans and I didn't want him to go up my shirt. 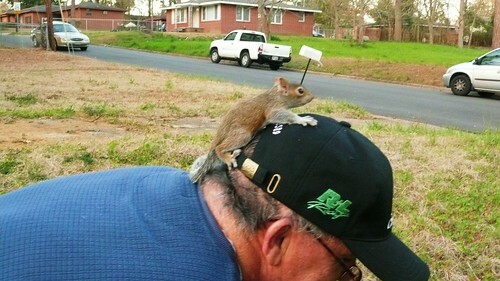 I would have had to take it off in the front yard. That would not have been good! 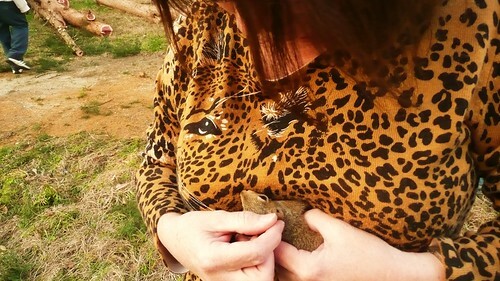 He was scared but amazingly calm while I held him. He was so cute. I wanted to keep him but after I decided he was old enough to forage for food for himself, I realized that he was a wild animal and would live longer in the wild than in a cage. I don't think that's how he would have chosen to live if he'd been given the choice. Rentman was snapping pictures of him and decided he wanted to hold the little guy. 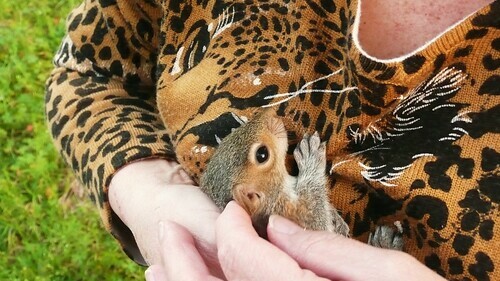 When I went to hand him to him, I guess he (the squirrel) got frightened. Well, this is where he ended up and Rentman was screaming like a little girl--well maybe not that bad but he makes fun of my son who does NOT like spiders. When he sees a spider, he screams like a little girl. So I had to joke with him about the baby squirrel. After I got him off of his cap, he decided I was doing better with it. So I got him calmed down again and wanted to keep him so bad. Look how cute he is! Look at those little eyes! He was just a little snuggle bunny. But--I knew what I had to do. So I took him over to the pile of branches where hopefully he would find his sibling and mom. And I choose to believe that they are all living happily ever after. Don't spoil my story for me! Okay??? Just let me live in my little fairy-tale world. I'm happy here! Mott, that is SO FUNNY! I was laughing so much I had to call my husband over to show him. 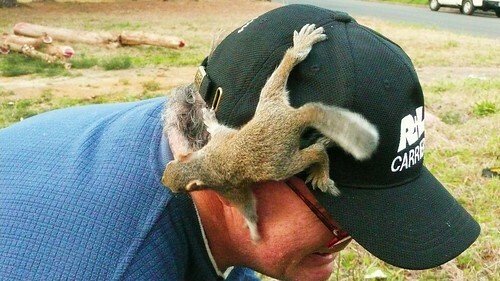 The picture of Rentman with the squirrel by his ear is HILARIOUS. His face is priceless!!!! I would have been so torn too; wanting to keep the little guy. You did the right thing though. What a great post! Oh my word! Animals just love you! I have to show this to my son when he comes home from school! 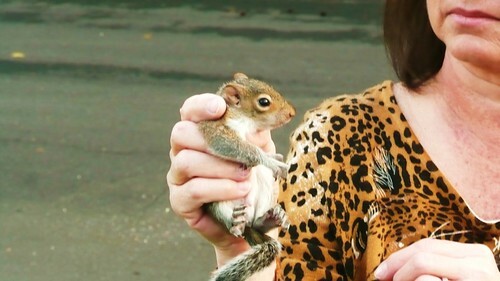 He loves animals and he is going to FREAK out about the baby squirrel! I am believing that they all live happily ever after too!